07 Nov 2018 --- Symrise overcame headwinds from volatile exchange rates, raw material shortages and increased raw material prices to continue on a “dynamic growth track” reporting strong organic sales growth of 8.8 percent in the first nine months of the year and Group sales including acquisitions up 10.3 percent. Based on its strong nine-month performance, the company is optimistic for the remaining weeks of the year and is raising its sales outlook. Earnings before interest, taxes, depreciation and amortization (EBITDA) amounted to €475.7 million (US$546.5 million) which is down 2 percent from the same period in 2017 when it was €485.2 million (US$557.6 million). The EBITDA margin remained at a good level of 20.0 percent. The results come just a few days after Symrise AG opened a site for high-quality natural food ingredients in Banks County, near Atlanta, in the US state of Georgia. The group invested €50 million (US$57.4 million) in the facility, which follows high technological and sustainable standards. The step reinforces the pioneering role of Symrise on the US market and emphasizes its aspiration to further expand within growth regions. Following a very solid first half of the year, Symrise AG says it successfully continued its growth course in the third quarter with all segments and regions contributing to this positive trend. The Group says that taking portfolio and exchange rate effects into account, sales in reporting currency were up 4.6 percent to €2,382.6 million (9M 2017: €2,278.4 million). Based on the positive nine-month development, Symrise raises its sales objective, which had already been increased at mid-year. Symrise aims at outperforming market growth and at achieving organic sales growth of more than 8 percent in Fiscal Year 2018. "Symrise held its course extremely well in the third quarter, despite the headwinds from volatile exchange rates, raw material shortages and increased raw material prices. We fully utilized growth opportunities and reliably supplied our customers,” says Dr. Heinz-Jürgen Bertram, CEO of Symrise AG. “Moreover, we are already laying the foundation for our future growth and are consistently implementing our investment programs. After putting additional capacity for Cosmetic Ingredients into operation in the US, we have just a few days ago opened a new production facility for natural Food Ingredients. We will continue to manufacture our products close to our customers which allows us to maintain a direct presence in key customer markets and to make the best possible use of growth opportunities. All segments and regions experienced strong demand and contributed to the positive business performance. As in the first six months of the year, the sales trend in reporting currency was impacted by unfavorable exchange rates, in particular by the appreciation of the euro against the US dollar. As before, Latin America was the key growth driver at the regional level, with organic sales growth of 19.2 percent. In the third quarter, the region increased sales by even 25.2 percent. In the Asia/Pacific region, sales grew by 12.9 percent in the first nine months, followed by North America and EAME with growth rates of 5.7 percent and 5.5 percent, respectively. In Emerging Markets, sales increased by 12.8 percent. These markets, which are characterized by dynamic growth, contributed 43 percent to total sales. The Flavor segment, which includes taste applications, achieved organic growth of 10.2 percent in the first nine months. With exchange rate effects and the acquisition of Cobell taken into account, the segment experienced 8.3 percent growth in reporting currency in the period under review and sales of € 912.5 million (9M 2017: € 842.6 million). The Latin America region achieved the strongest organic growth, with sales increases well within the double-digit percentage range over the course of the year. This strong development was supported in particular by new business wins with global customers in the beverages application business. Significant contributions came especially from Uruguay, Brazil and Mexico. 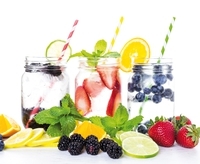 The North America region benefited from strong demand for flavorings for the beverage industry. The EAME region showed a very positive development as well. Growth impetus was delivered by Western Europe and Russia, where demand was strong, especially for applications in sweet and dairy products. The Asia/Pacific region showed a very dynamic trend as well, delivering double-digit organic growth in all application areas. Strong year-on-year sales increases were seen especially in China, India, and Vietnam. The earnings situation in the Flavor segment was affected by the overall rise in raw material costs. In addition, the lower margin of Cobell had an impact. Nevertheless, the segment increased the EBITDA by €3.6 million to €187.0 million (9M 2017: €183.4 million). The EBITDA margin stood at a solid 20.5 percent (9M 2017: 21.8 percent). As in the previous months, the segment Flavor remains also engaged in close dialogues with its customers regarding the pass-on of price increases. The Nutrition segment, which includes the Diana division with applications for food, pet food and baby food as well as probiotics (Probi), achieved organic growth of 5.7 percent in the first nine months. In the third quarter, organic growth in sales reached even 10.0 percent. Taking into account exchange rate effects, the segment achieved sales of €471.4 million (US$541.8) in reporting currency after €475.7 million (US$546.7 million) in the prior year period. The slight decline reflects the announced destocking by a major customer of Probi in the first half of the year. In the third quarter, the order intake for probiotics normalized to a large extent. Nutrition generated an EBITDA of €96.9 million (US$111.3 million) in the reporting period (9M 2017: € 105.6 million). The temporary decline mainly reflects the lower sales contribution from Probi in the first six months and ramp-up costs for the new Diana site in the US. Despite these one-off effects, the EBITDA margin stood at a good 20.5 percent (9M 2017: 22.2 percent). The Group once more increases its 2018 sales target which had already been raised in August. For the Fiscal Year 2018, Symrise now expects an organic sales increase of more than 8 percent. With this growth rate, Symrise would again significantly outperform the market which is expected to grow between 3 to 4 percent. In addition to ongoing strong demand, Symrise expects growth to be driven by the various investments in capacity expansions and the enhancement of innovation. The Group expects the shortage of raw materials to persist in the remaining weeks of 2018, however, considers itself well positioned to compensate for the market shortages on the basis of its own backward integration. The Group will prevent non-delivery of supplies through access to its own sources of key raw materials. Nevertheless, Symrise expects the purchase costs for raw materials to remain on a higher level.